The sea was ruthless as they tottered on – silly humans. They really knew of no other pass time but sailing, and fishing, hunting, bird catching, etcetera. The earth has grown weary but she delivers still; she shall stop producing when her produce is wanted the most, and THAT will be her ultimate revenge. That shall be her salvation: she, too, will die, after having been dying for so long. Qattara’s anger was as boundless and as illimitable as my mighty sea – spreading and affecting everyone around her, so I DID wonder, at this particular point in time, why she seemed to compose herself much too quickly after an anger scare. I had known the mermaid for over five hundred years now – more than enough time for one to become acquainted with one’s moods and actions. I looked over at the creature and asked it what the matter might have been, and she told me that she was in love. ‘In love with whom?’ I heard myself ask, floating distractedly on the sea surface, recalling the number of times I’d said those particular words: they HAD been countless. 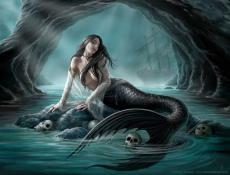 ‘A human god,’ was the mermaid’s reply. ‘How?’ – My, my, wasn’t I the curious companion?! I should, as I usually told myself, long after those little scenes of heartfelt comradeship had led to unfathomable danger and peril, have just kept my mouth shut. Qattara’s voice sounded through the caves and whipped into the trees and I felt its power devour all the land. Mother earth was welcoming us into the part of her we did not, and could not see. She was carrying our voices through the wind and stroking our palms with the sand she’d left for us to sit in. I embraced her presence, and she mine. ‘There he is,’ Qattara breathed, once her affianced was in sight. ‘Which one?’ I called, looking at the crowd of men nearing our location on the beach. The fools! I looked for a minute, and saw the apple of my best friend’s eye. He WAS a sight for sore eyes, and my eyes were sore just looking at him. Just to the man’s right, was a man pulling himself towards us with the use of his hands. He had legs, but they were entwined together, and they looked too thin and bony to support his weight, let alone serve their purpose and help him walk. He had dirty hair, and his eyes were sandal brown. They reminded me of dusty topaz – of everything that was brown, shiny, and beautiful. I opened my mouth to whisper his earthly name – ‘Man,’ – and he answered. He was the most striking thing I’d ever laid my eyes on, because he looked different from the others. He struggled so to get close to me, and once he was, I let him marvel at the beauty that I was. I let him run his hands through my hair, down my collar bones and up my tail fin. I was entranced, captured by the man’s vulnerability – I wanted him, and I wanted him forever. I took him in my arms and cradled him like a baby, and stroked and kissed his face (how soft and dry his skin was!). I hissed at her, and did not allow her to distract me from my man anymore. He was mine! She had hers, the “human god”! I felt a vicious greed creep up and capture me, and I felt a jealousy for this man I’d never had to feel before. I held him close and asked him to tell me he loved me, (which he hastily did) and jumped into the pool, ready to show him my world – to run away with him, forever. I was swimming at the speed of light, excitement gripping me. I wanted so much at that particular moment, that it was impossible for me to decide a destination. I finally decided to swim him to my favorite rock, the one that overlooked the ocean. It was sunset by the time I hauled myself out of the water, onto the rock...and too late to save my darling. His face was still but his eyes were open, watching me. There was no love in his eyes. No emotion I could make out other than deep contempt for his murderer – for me. As the sun descended on my naked back, and on his tranquil, sodden face, I felt a warmth down my cheek that I’d never felt before – but that wasn’t the problem. The problem was the sadness that had instantly gripped me, taken me captive and stolen me from my right mind. I couldn’t comprehend – why wasn’t he breathing?! Why was he immobile?! What, I asked myself, had I done?! And then came the anger, in flashes of red surfing crimson tides. Then came the reality: every human dies. © Copyright 2019 Virtual Writer 2010. All rights reserved. That was utterly AMAZING!!! I LOVED the ending! You've carried out an undeniable fact: nothing is ever permanent. I really enjoyed that and I like your choice of words. And mermaids ... I haven't read about them in a while. Great job on this one, combining fantasy and reality. I never could have thought of that! I really liked this one!! Well done and good luck on the challenge. I'm working on an entry too!! Thanks as well if you've read my books/poems yet!! amazing! this is such a great story considering that it is your first!!! I just loved it. It had a really great beggining that gets your attention right from the stat. There is no need for you to beg me to read your work, I will always be here to read your stuff. You work is just so good. Your AWESOME!!! That was absolutely stunning totally unexpected. You really dug seep and came out with a masterpiece. Not the usual one would expect. Clap! Clap! Clap! Great work. i would definitely suggest that you separate the part where people talk correctly and be more clear on who says what. also edit it a bit, a few minor errors can be found throughout. This is really a fantastic piece of work. I hope you continue to enjoy the art. This is good, it's beautiful yet dark. I like the layout and the fact that she changes her opinion about humans. I like the emotional part about it and it didn't at one point get boring. As someone else said above the fact that she chose a crippled person was a good thing. That she chose something weak and fragile would suit her. A man that would not hunt or hurt the world she loves so much. It was a great piece ^_^ I enjoyed it a lot. I know (about the same mistake thing)! Ironic, huh?! A Day At Work. A Day too Late. This page was created in 0.4056 seconds.